A young boy (Fred Savage) is ill in bed when his grandfather (Peter Falk) visits and begins to read him a story - a story called The Princess Bride. Initially suspicious that this is just a boring “kissing” book, the boy is soon gripped by the truly exciting adventure that lies within its pages. Yes it's good. A hundred times yes! The Princess Bride is a perfect family movie because it was created for a family. It was not born of a cynical need to make money. No, this story was created by writer, William Goldman, to satisfy the bedtime story demands of his two daughters. One wanted a story about a princess, one a tale about a bride - hence the title. Goldman then added all of the elements that he had enjoyed in stories as a child. As a result, the narrative grew and soon became so important to Goldman that he refused to hand over the film making rights until he was sure that he had found the perfect director (Rob Reiner). I can’t imagine anyone else playing any of the central roles in The Princess Bride. They are all just perfect choices. However, the casting process was not always easy. For example, Rob Reiner auditioned over 500 women for the role of Buttercup before Robin Wright was offered the part. However, Reiner offered Mandy Patinkin any role that he wanted in the film. And, yes, that is him from Homeland. The Princess Bride’s storytelling is wonderful. There is never a dull moment and the story moves at a cracking pace. Crucially, everyone - from the youngest to the oldest viewer - can keep up with the narrative. The kiss between Wesley and Buttercup is still one of my favourite onscreen smooches and even my son (who was, at first, just as skeptical as the grandson in the film itself) really doesn’t mind the romance. The action in this film comes thick and it comes fast. There is never a dull moment - The Princess Bride will keep even the fidgety of fidgets gripped. The cameos in this film are all superb. For example, Billy Crystal is on top form as Miracle Max and Peter Cook is fantastic in his role. Both have precious little screen time but both provide brilliant and memorable performances. Mark Knopfler, of Dire Straits, wrote the wonderful music for The Princess Bride. According to reports, Knopfler only agreed to do this if Reiner himself agreed to put a reference to Spinal Tap into the film (a hat, which is hanging in the grandson’s room). A great part of the sheer fun of this movie is repeating its key lines afterwards. I love “inconceivable!” but my favourite is “Hello, my name is Inigo Montoya. You killed my father. Prepare to die”. According to a Buzzfeed article about the film, Reiner met mob boss, John Gotti, and six of his men on a street in New York. One of the men quoted this line at him and then they burst out laughing. I just love the sword fight between Inigo and The Dread Pirate Roberts. This complicated swashbuckling scene works so well because you can see that it is the two actors who are fighting and not a couple of stunt doubles. As a result, this key part of the film manages to be both hilarious and exciting. Although it was no box office smash when first released, The Princess Bride has become a much loved favourite in the intervening years. I can’t think of many other films that could captivate and entertain the young and, well, perhaps not so young as well as The Princess Bride. 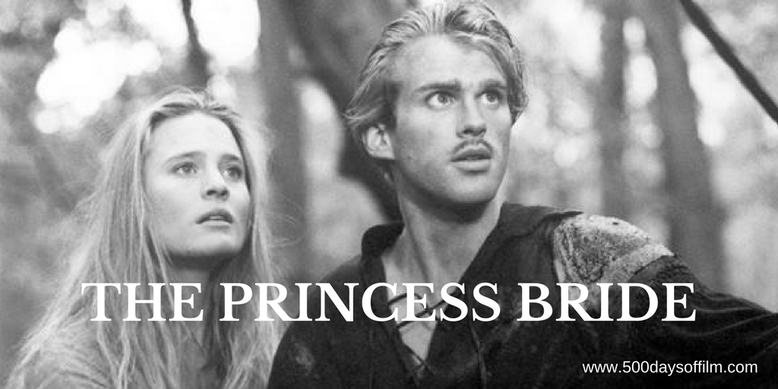 Have you seen The Princess Bride? Do you love it as much as me?